Hearing loss is the third most common physical problem in this country. The idea that everyone with hearing loss knows that they have hearing loss is just one in many myths that accompany this condition. Since many people lose their hearing gradually, they may not realize the problem exists. Putting the misconceptions to rest improves hearing awareness and may tell you something about yourself or someone you love. 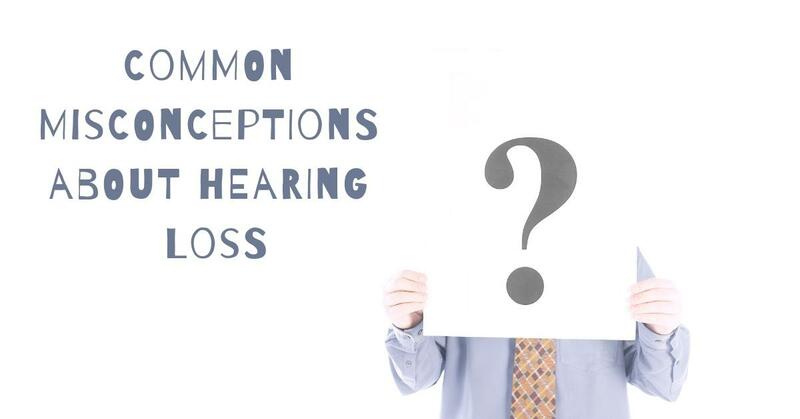 Here are some of the common misconceptions about hearing loss! While hearing loss greatly affects older people, it is not true that only older people lose their hearing. Indeed, it is more common among older people, with one in three people over the age of 65 experiencing some degree of hearing loss. However, hearing loss should be on young people’s radar as well. Among today’s teens, hearing loss is up 30% from teens in the 1980s and 1990s, according to an NBC report. Preventative actions (or damages) from youth can affect hearing later in life, so it is imperative to understand what causes the problem to worsen, as well as see the potential negative effects of the future. Loud music from earbuds, concerts, night clubs or work-related noise can all contribute to early hearing loss. To see these staggering numbers in younger populations is concerning. The numbers continue to rise in their projections, hitting 73 million people by 2060. If young people do not focus on protection and prevention, they will suffer earlier and worse than previous generations. Hearing loss is common among older adults, but it does not affect everyone over a certain age. Older people tend to lose their hearing due to natural processes of aging or due to other factors such as: exposure to loud noises, ear infections, and medications that are toxic to hearing, to name a few. Hearing loss may accelerate with age, because the individual components of the auditory system may be damaged due to any of these above factors. At the same time, it is important to note that it is not inevitable that all older people experience hearing loss. An annual hearing test is a good way to track your hearing abilities, regardless of your age. Only a part of hearing loss has to do with sound amplification. Turning up the TV or asking people to talk louder may help you in some ways, but many people with hearing loss have the same complaint: “I can hear, but I can’t understand.” In other words, people with hearing loss may be able to recognize sounds at a certain volume, but may have difficulty understanding or making sense of what is being said. To address this, hearing aids have been designed to process and analyze sound to deliver clarity and speech recognition. Hearing loss is often misconstrued as lack of focus or selective listening. Additionally, hearing loss is often thought of as a sensitive subject, so your loved ones may be hesitant to bring up the issue with you. Incorporating an annual hearing test into your overall health regimen is a good way to track your abilities and get treatment as soon as possible. Hearing loss can have a range of consequences that depends on the individual and their unique type of hearing loss. The most common experience is a reduced ability to understand other people, particularly in noisy situations. If left untreated, hearing loss can have other negative social and health impacts in both adults and children that go beyond the hearing impairment itself and include reduced quality of life and well-being. Potential health impacts from hearing loss can include headaches, muscle tension, and increased stress and blood pressure levels. Some studies have linked untreated hearing loss in adults to depression, fatigue, social withdrawal, and impaired memory. New studies reveal that hearing loss increases your risk of cognitive diseases like Alzheimer’s and other forms of dementia. One study found that with every 10 decibels of hearing loss, the risk increases by 20 percent. Loud noises could lead to permanent hearing loss, but that doesn’t mean you can’t enjoy your favorite musicians! Just make sure you bring ear plugs and most importantly make sure you are wearing them correctly. If you regularly find yourself in loud environments, it could be helpful to get custom hearing protection. Modern hearing aids are very sophisticated and sleek. The effectiveness depends on the type hearing loss you have and the severity. A hearing aid will not fully restore your hearing, but you will hear better with one than without and that makes it worth having even if it is not a perfect solution. Furthermore, hearing aids reconnect you to the sounds of your life, help you maintain your important relationships, and continue to be active in your daily life. What’s old about that? If you or someone you love has hearing loss, get the facts straight. Contact us at Beverly Hills Hearing Center to get evaluated for a hearing aid and start enjoying the sounds around you again.